I’ve mentioned in previous posts a phrase that is useful to keep in mind for life in general, and also when creating, and negotiating, a contract. The phrase is ‘Keep It Simple, Simon” or KISS. If you’re a freelance graphic designer then you’ll no doubt want to focus on your core business, creating great graphics, rather than wading through the mire of a complex contract. 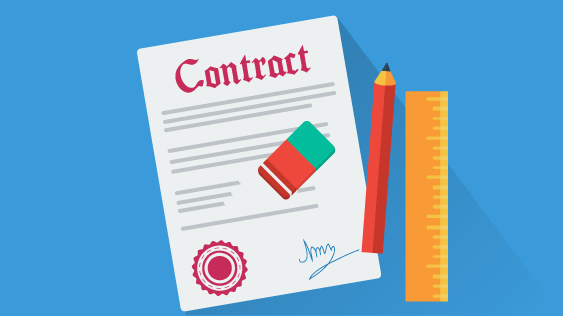 But the question is, is it possible to create an effective graphic design contract, that is simple to understand and is legally binding under contract law? Scope – outline of what the work covers. It may also have a commencement and end date in here. Delivery scope – full list of deliverables and any phases or milestones of delivery. This should include any mock-ups, images, and revisions. Revisions is a really important aspect to include in the delivery scope, as this is where scope creep can come in. Deliverable format, and how deliverables will be supplied. For example, set out simply what file format you will deliver images, photographs, and other files in, and how you will deliver them, e.g. via specified Cloud folder. Change control is a vital clause in a design contract. If you don’t have it, you have no formal way in which to bill for additional work that is above and beyond that contracted in the SOW. Make sure you have some simple way of making sure that if changes are requested, they are billable – link this to your deliverables. A change control clause can be something as simple as stating that anything outside the deliverables will be billed @ $x per hour. Sometimes the SOW part of the contract also sets the payment schedule within that section, but often the payment schedule is in a separate part of the contract. Make sure you list all of the deliverables or milestones separately so that payment can be called off. The payment schedule is also likely to have a payment call off reason, such as completion of mock-ups. Outline the payment terms for each deliverable, and which method should be used for payment. As a freelance designer, you need to be fully aware of the area of copyright law and design. There is a whole area around the legal prerequisites of what you can and can’t copyright. Your contract will need a clause on what copyright will be released to the client on payment. You should also try and add in a clause that allows you to showcase your work done as part of this project, but you may get push back on this from the client. For a contract to be legally binding you need to have it signed by all parties involved in its execution, i.e. a representative of your design agency and your client. If you decide to simplify your contract process by automating it using software like ApproveMe ESign, then you can add digital signatures to an electronic version of your contract. 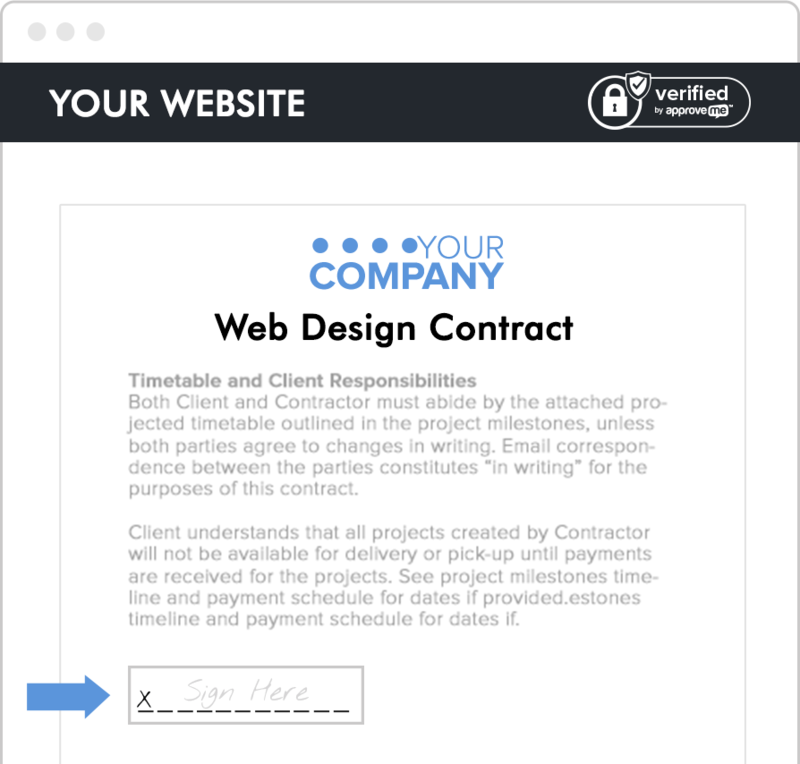 ApproveMe ESign lets you and your client easily add an electronic signature to the contract to show agreement to the terms. This signature abides by electronic signature laws, like ESIGN. Once signed, the contract can be held in a central repository, like DropBox, and alerts sent to all parties to let them know the contract is completed and available. Keeping your contract simple and within contract law, can be achieved by using plain language and having precise requirements outlined. But simplicity should not be at the expense of getting it right. Contract creation and negotiation is about using plain language that cannot be misinterpreted. Keeping sections such as your deliverables list simple, concise, but clear, will help prevent the dreaded scope creep. Clarity is good for both sides of the contract negotiations. If you know what you are doing and at what price, your client will also be clear on this too and it will give focus to expectations. Simple, precise, graphic design contracts, that have been created collaboratively, will manage expectations and create happy clients.